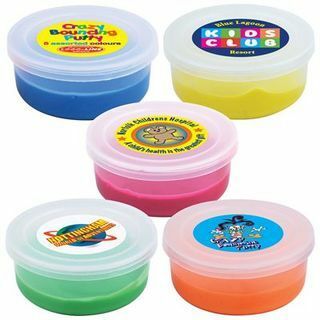 50 grams of assorted colour putty in opaque 2 piece tub. Comes in an assortment of 5 great fluro colours - pink, yellow, green, blue and orange. Roll putty into a ball and bounce it! You can mould it, stretch it and snap it. Make it into wild shapes. Great promotional product for Children's Events, Event Merchandise, Fetes & Festivals, Outdoor, Point redemption programs, Cafes & Restaurants, Councils, Education, Tourism.